Machu Picchu offers incredible ways to get to it; However, the simplest, fastest and most comfortable way is to make the trip to Machu Picchu by train. Each day more than 2,000 people choose to enter Machu Picchu in this way. If you do not enter Machu Picchu by train you will have to choose between; Enter through the door of the sun after a 4-day trek through the Inca Trail, or take the alternative route to Machu Picchu by Santa Maria. What do you need to get to Machu Picchu by train? First thing’s first; If you want to get to Machu Picchu by train on your own, the first thing to do is to book the Machu Picchu tickets of your choice;Just know the date you will enter Machu Picchu, book train tickets, these are also limited. To book Machu Picchu tickets you should check availability; If you find available tickets, reserve them; Especially in the case of the ticket Machu Picchu + Huayna Picchu, the availability of these tickets can vary greatly in just minutes; With more reason, if you are not reserving with sufficient time of anticipation (3 months). How long is the train trip to Machu Picchu? The train ride to Machu Picchu from the town of Ollantaytambo takes around 2 hours. 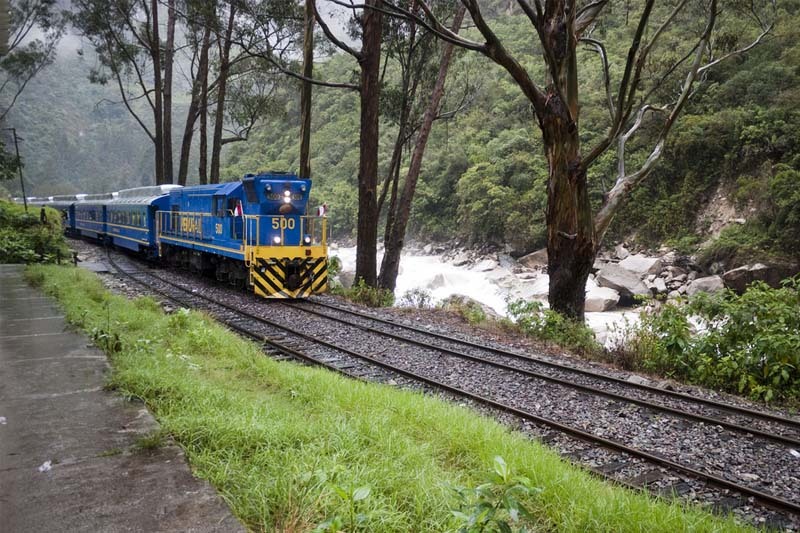 The train goes along the banks of the Urubamba River to Aguas Calientes, through the Sacred Valley of the Incas. What are the train companies to Machu Picchu? You can choose between different train services to Machu Picchu, from the tourist class to the luxury services all inclusive. There are two companies that provide train services to Machu Picchu, PeruRail and Inca Rail. Depending on the train service you choose, you can board it in the village of Poroy; However, in most cases you will board your train at Ollantaytambo station, at kilometer 68 of the railroad from Cusco to Machu Picchu. Do not know how to get to Ollantaytambo ?, enter here. To 15 minutes of Ollantaytambo you will be able to see snow in the tip of the Veronica, a mountain of 5,682 meters of altitude pertaining to the mountain range of the andes. You will see the villages of Phiri, Tanccac, Chillca and Piskacucho, also the entrance to the Inca trail at kilometer 88, in a place known as Qorihuayrachina. From kilometer 93 known as Pampacawa, you may notice an increase in temperature and vegetation change. After a few minutes after passing the kilometer 104, on a mountain to the left you will see the archaeological site of Winaywayna and at the foot of this, the archaeological site of Coquesuysuy composed of corridors and enclosures. At kilometer 106 you will see the hydroelectric of Machu Picchu, which supplies electricity to parts of southern Peru. Once at this point you will find just 20 minutes from Aguas Calientes station (Machu Picchu village), the village at the foot of the Inca city of Machu Picchu and the end of the train journey to Machu Picchu. 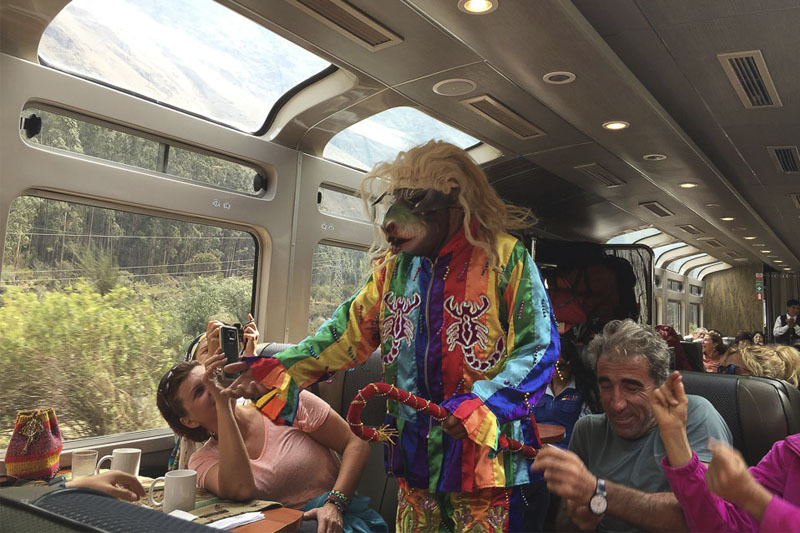 The Vistadome train of PeruRail is completely surrounded by panoramic windows that allow you to enjoy the incredible landscapes of the Sacred Valley and the entire tour along the banks of the Urubamba River. And in case you did not know, this short route by train is considered among the most amazing in the world. It is certainly an unforgettable experience. If you do not book your train tickets in advance, you will have to choose between the remaining services, which are usually the most expensive. Train tickets are sold out quickly, and you will not like having the Machu Picchu tickets and you do not have to get there, so book your train tickets (round trip) immediately after knowing the date you will enter Machu Picchu. Once in Ollantaytambo, if time and your train schedule allow, we recommend visiting the Inca ruins of this beautiful town, these are impressive and one of the best prior to what you will see in the Inca city of Machu Picchu. Although you can go up from Aguas Calientes to Machu Picchu walking, Just to the side of the train station in Machu Picchu you will find the bus ticket office to Machu Picchu and in front of it, the small station where you can approach them. Aguas Calientes is a very small town and it will not be difficult to find these places.